I can't tell you how hard it has been to refrain from posting pictures of the Christmas Quilts I have made! This picture of a quilt for a loving mother of 2 daughters is safe to post. 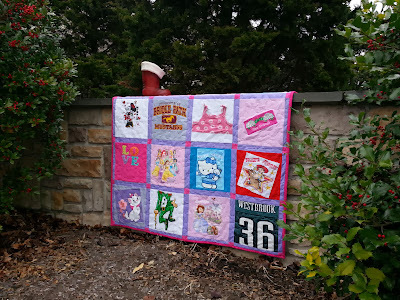 I love the childhood tees included in this large lap quilt! The father is sure to get major brownie points for this gift! 21 Christmas Quilts have been made this year!